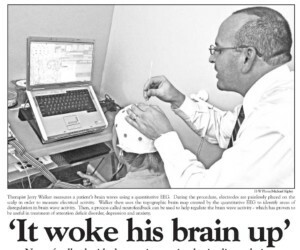 Get more information from the article about neurofeedback. Like other forms of biofeedback, Neurofeedback Training (NFT) uses monitoring devices to provide moment-to-moment information to an individual on the state of their physiological functioning. The characteristic that distinguishes NFT from other biofeedback is a focus on the central nervous system and the brain. Neurofeedback training (NFT) has its foundations in basic and applied neuroscience as well as data-based clinical practice. It takes into account behavioral, cognitive, and subjective aspects as well as brain activity. Thus, it meets the American Psychological Association's definition of an evidence-based intervention since NFT is "...the integration of the best available research with clinical expertise in the context of patient characteristics, culture, and preference." NFT is preceded by an objective assessment of brain activity and psychological status. During training, sensors are placed on the scalp and then connected to sensitive electronics and computer software that detect, amplify, and record specific brain activity. Resulting information is fed back to the trainee virtually instantaneously with the conceptual understanding that changes in the feedback signal indicate whether or not the trainee's brain activity is within the designated range. Based on this feedback, various principles of learning, and practitioner guidance, changes in brain patterns occur and are associated with positive changes in physical, emotional, and cognitive states. Often the trainee is not consciously aware of the mechanisms by which such changes are accomplished although people routinely acquire a "felt sense" of these positive changes and often are able to access these states outside the feedback session. NFT has been found to be a successful intervention in modifying seizures, attention, traumatic brain injury, chronic pain, autistic behaviours, headache/migraine, depression, anxiety, addictions, and sleep problems. Also, it has been applied effectively in meeting educational goals such as resolving reading and math disabilities. Moreover, it has been used to help maximize the performance of athletes, artists, and executives. Lasting positive changes have been documented after successful NFT. Neurofeedback for Addictions: The State of the Science Some brains are under-active and others are over-active which result in different moods. Using alcohol and drugs to help cope with life's moods too easily leads to addiction and doesn't really help with the moods in the end. For 30 years neuro-feedback has been used to help those caught up in addictions. The latest research is having such success that it is changing the forms of standard treatment in addictions centers. At last there is something that really helps many get over addictions without lapses or requiring continual support systems and treatment centers. Sleep Disorders There are more than a dozen forms of disordered sleep that affect an estimated 40 million Americans. Neuro-feedback is an established means to retrain the brain to restore a more normal experience of sleep. Watch the video to understand more about Neurofeedback.